Business Values The core values of our organization are those values that underlie our work & strategies we employ to fulfill our vision & mission. Customer First quality of our products & services. Strategic Alliance • Tie-up with SOLIDA, Spain for providing complete TURNKEY solutions • “Till date SOLIDA team has connected more than 4900 MW of renewable energy power plants across the world. Tie-up with VT Energy , Italy for various EPC projects/Tenders of Solar PV Plants. VT Energy is a renewable energy company, a division of VT Telematica, a leader in the ICT market. Value Engineering Speed of Execution Robust Background In House Facilities Proven Experience Industry-leading innovations in system design and construction to optimize energy production and system reliability Record Time Project Commissioning Credentials Leading corporate conglomerate minimizing the risk associated with any size of project. 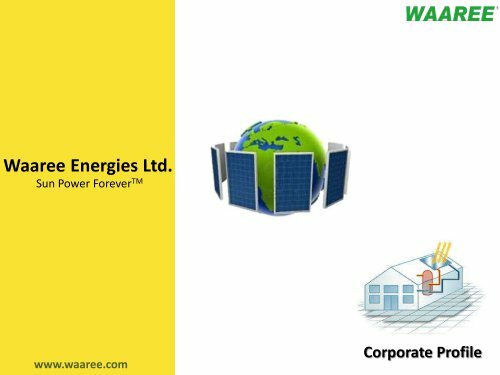 In-house manufacturing of PV modules enabling optimal costing, quality and delivery A solar energy powerhouse, backed by portfolio of some of the most significant solar energy projects.